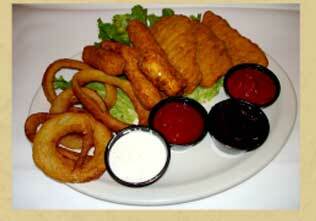 Buffalo style wings served Plain, or smothered in your choice of Hot, Mild or BBQ sauce. Served with celery sticks and bleu cheese for dipping. A platter of assorted greats. Mozzarella Sticks, Jalapeño Poppers, Chicken Tenders and Onion Rings. Served with pizza sauce, ketchup, ranch and fiesta ranch dressing. You can't go wrong! Sorry, no substitutions. A great combination of all the favorites! 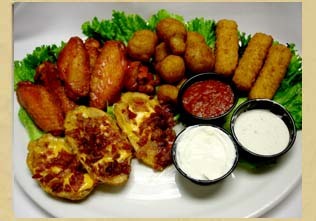 Potato Skins, Mozzarella Sticks, Garlic Breaded Mushrooms and Hot Wings. Served with ranch dressing, pizza sauce, bleu cheese dressing and sour cream. Cream cheese stuffed jalapeño peppers breaded and fried crisp. Served with our own fiesta ranch for dipping. Green beans breaded and fried to a golded brown and served with ranch dressing. Crispy tortilla chips piled high and covered in shredded colby cheese. Served with fresh homemade salsa. 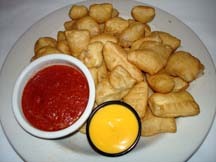 Deep fried bite sized puffs of our homemade pizza dough lightly dusted in a combination of spices. Served with our famous pizza sauce and nacho cheese for dipping. Creamy boursin cheese nestled in a tomato, olive oil, garlic and onion dip. Topped with fresh pesto sauce and served with grilled herb romano flatbread. Giant sweet onion rings dipped in a special batter and fried to perfection. A platter of Brew City fries smothered with colby cheese and covered with crispy bacon bits. Served with ketchup and ranch dressing. Battered mushrooms fried golden brown. Served with ranch dressing. A creamy blend of flavors topped with mozzarella and baked. Served with pita bread and tortilla chips. Diced tomatoes, onions, fresh garlic and basil lightly tossed in olive oil and balsamic vinegar, served over grilled Italian bread and garnished with asiago cheese. Fresh breadsticks covered with creamy mozzarella cheese and brushed with garlic butter. Served with our homemade pizza sauce. Homemade breadsticks with our signature garlic butter, romano cheese and pizza sauce. These mozzarella sticks are a hit! Served with our homemade pizza sauce. Idaho potato skins filled with crumbled bacon and melted colby cheese. Served with ranch dressing and sour cream. generous portion of deep fried chicken tenders. Lightly tossed in our secret recipe seasoned flour and fried to perfection. 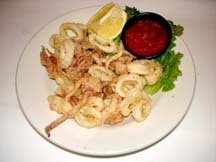 Served with our homemade sauce and fresh lemon. A large flour tortilla stuffed with melted cheese, freshly made pico de gallo and a hint of chipotle pepper. Garnished with lettuce and tomato. Served with salsa, and sour cream. (c) Uccello's Wayland/Uccellosway.com all rights reserved.